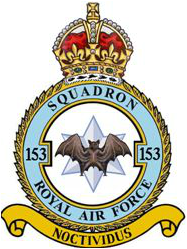 The squadron, having operated both from Northern Ireland and North Africa, wished to commemorate the fact by including in its badge a white star-which appears in the arms of Northern Ireland and a bat. The bat is indigenous to North Africa and is also a nocturnal predatory animal which is intended to symbolise the unit's night-fighting activities. Authority: King George VI, October 1944.